Google has launched a major addition to Google Trends named Trends for Web Sites. Trends for Web Sites extends Google Trends by enabling you to search for web site addresses, as opposed to just searching for trends by keyword. R.J. Pittman, Google’s Director of Product Management, told me that by entering a domain name into Google Trends, Google will return traffic, search, and geographic visitation data for that site. Trends for Web Sites will show sites related to the domain name you entered. It will also show searches that are correlated to the domain name, and if you are logged into Google, it will show the estimated traffic for that site. In addition, you can enter in up to five domain names and Google will plot line graphs for all the domains you entered in. Under the unique visitors chart is additional data. The “regions” data is something brought over from Google Trends for keywords, which shows how popular your site is by searchers in specific regions. The key new data here is “also visited” and “also search for…” data. 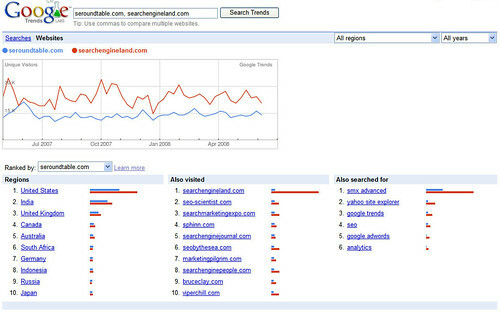 The “also visited” data shows sites that searchers also visited based on correlated search data Google has. The “also search for…” shows other searches the searcher searched for that is related to this site. Google will show up to ten data points per section, but often might show less data than ten. 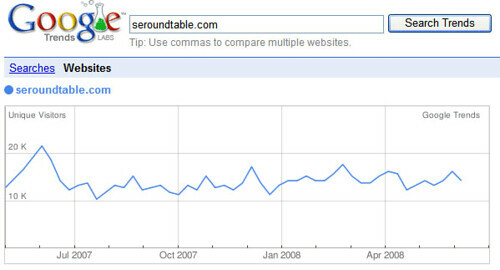 One thing that jumps out to me is that more people who visit searchengineland.com are likely to search on [smx advanced] than those who visit seroundtable.com. Why is that? SMX Advanced is a show that Search Engine Land’s parent company, Third Door Media, hosts. How is this useful? From an SEM’s perspective, not only is this a great way to find some great keywords, but it can be a great tool for find great resources. Matt Cutts explained to me that he used it to find other sites that offer similar services for a service he was looking for. Matt’s example was yousendit.com, a service that lets you give people a URL to a large file for them to download. Matt wanted to find other services that were similar to yousendit.com. So he typed it in and found sites such as sendthisfile.com, mailbigfile.com, sendit.com, and so on. Very useful, indeed! Now, if you think like a link builder, you can use this tool to find sites that are within your “neighborhood” or industry. So if I want to find link partners for the Search Engine Roundtable, I enter in seroundtable.com, look at the related sites, and ask all of them for links. Then I go to all of those sites and see who is related to them. You can, theoretically, keep expanding that list, as far is it makes sense. The useful applications for a tool like this is pretty extensive. One thing you should keep in mind is that this tool bases its data off Google search data, aggregated opt-in anonymous Google Analytics data, opt-in consumer panel data, and other third-party market research. In addition, the search volume numbers are estimates and Google only shows ten search phrases for a domain name. Trends for Web Sites is a global product, available in the US and worldwide, but the only supported language is English. In any event, I am personally very excited to play with this new product. I am even more excited to hear about new features that will hopefully be launched in the upcoming months.